The design team has researched the history of Deptford. But they have made very little use of the information in the design process. The above drawing shows the site (1) left, in the seventeenth century (with Evelyn’s map and with his garden in colour), (2) centre, in the nineteenth century, with the Royal Dockyard north of Evelyn’s garden and with traditional Deptford streets of terrace houses with private gardens south of Evelyn’s garden), (3) right, as proposed by the developers with a grid of superblocks separated by boulevards. The over-arching point is that Convoys Wharf is not just any old bit of derelict land awaiting re-development. It is a historic site of great importance. The land once belonged to the leading English garden theorist of the seventeenth century. John Evelyn used his own estate to experiment and advance the art and the science of gardening. He let some of the land become a naval dock because he cared about maritime affairs as much as he cared about gardens. Dame Joan Ruddock (MP for Lewisham, Deptford) described Convoys Wharf as ‘one of London’s best kept secrets and one of its greatest opportunities’. She said the site could ‘offer an amazing place for locals, new residents and visitors alike’ (22 January 2014, Hansard, Volume 574). The developers have ignored this great opportunity, except for retaining the listed buildings they could not demolish – and using maritime names for marketing purposes. Evelyn’s intellectual legacy should to inspire an urban landscape design approach which advances this art and practice. The architectural and landscape design of Plot 08 has an ‘anywhere’ quality: the blocks could be anywhere in the world, including Hong Kong. Apart from the site plan, which extends to Greenland Dock, Greenwich and the Isle of Dogs, there is very little context information on the drawings. It is an off-the-shelf anywhere design. It is not a context-sensitive site-specific design for a great historic site in Deptford. The balconies on the blocks are thoughtlessly insulting. They appear to have been designed as decorations to relieve the tedious boredom of the block facades. Instead, the balconies should be designed as social space and cultivation space for the residents. The high residential density of the development makes it impossible to follow the local tradition (of terrace housing in Deptford and elsewhere in London) of giving each house a private garden. But giving each resident a ‘garden in the air’ balcony is possible and should be done. Instead, the application drawings show small glazed ‘ledges’ suitable for little more than hanging washing and storing bicycles. Much more design work, and information, is required for the green roofs. Like the balconies, the roofs should be planned and designed as social space and cultivation space. The area should be a community skypark for residents. As a contribution to flood prevention, more effort on the design of the roofspace would make it possible for much of the rainwater to be stored, used and evapo-transpirated (so that it does not have to be taken off site in underground drains). It is good that the blocks have shops with street frontages at ground level and the street trees are welcome. But the design of the street spaces is crude, bland and people-unfriendly. The overall design of the Plot 08 blocks requires much more vegetation: (1) at street level (2) on the courtyard podium (3) on balconies (4) on walls (5) on roofs. 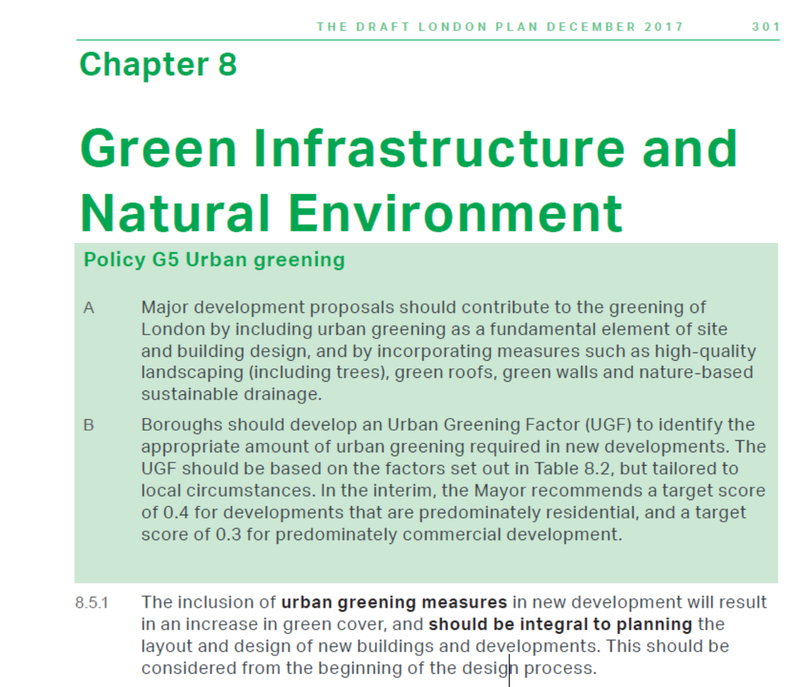 This is required as contributions (1) to sustainability (2) to biodiversity (3) to mitigating climate change (4) to the grand objective of making a Greener Deptford and a Greener London.